The fruit of the almond tree and the almond shrub is a flat, egg-shaped, and surrounded by velvety fuzz dry drupe with one smooth stone core of only with a seed - the almond. Both adults and kids will love the finely mild and sweet fruit. Their sweet flavour comes from our blanched ALMONDS very special good effect, because the protective brown membrane that the amygdalas surrounds like a protective layer was removed carefully by us and nothing of it bitter things may cause interference to subtle sweet flavour. What remains is a beautiful creamy white almond which literally invites you directly for accessing it. 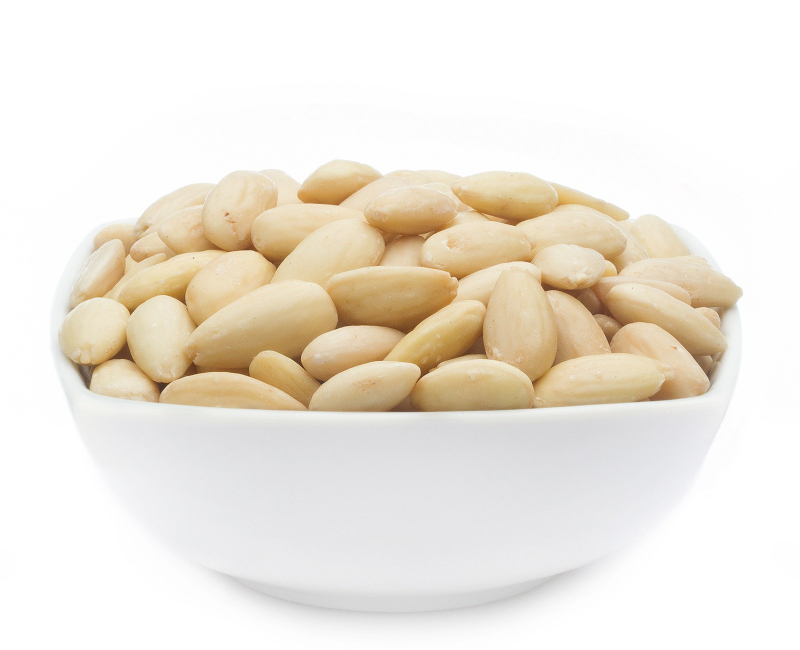 Not only for the production of marzipan the sweet almonds are used of the highest quality, which cavorts in blanched ALMONDS. But not only in terms of cuisine, the sweet almond is very popular. As a supplier of the mineral magnesium for the ingredients of almond act excellently on the heart and circulation and protect against stress because their high B vitamin content strengthens the nerves. They provide calcium for bone and potassium for digestion and contribute to a healthy blood pressure. Vitality gives us the iron content and thanks to Vitamin E keeps us young. The white almond is a gem in every respect and a handful of providers every day of your most private spa experience. Nutritional experts praise the almond for years already to the skies, because they demonstrated a very positive impact in terms of weight reduction on the organism. Almonds protect against the fateful cravings and act as a natural control of satiety and help so naturally with excessive appetite. A few almonds a day and you have along the way thoroughly enjoyed the natural sweetness and a healthy saturation. Enjoyed together with a banana or an apple, they are a quality snack with their protein naturally contained. As our blanched ALMONDS are natural, they are for all kinds of pastries, as a component in cereal or pureed with water as almond milk an excellent ingredient ready to enjoy and use with no regrets.